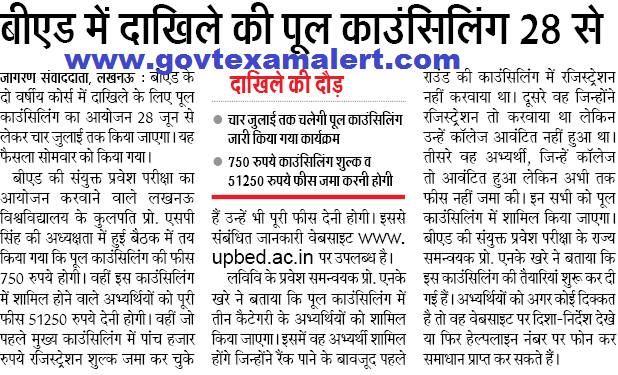 Mahatma Jyotiba Phule Rohilkhand University (MJPRU) has organized this Year’s B.Ed Joint Entrance Exam. JEE B.Ed 2019 was conducted on 15 April 2019. 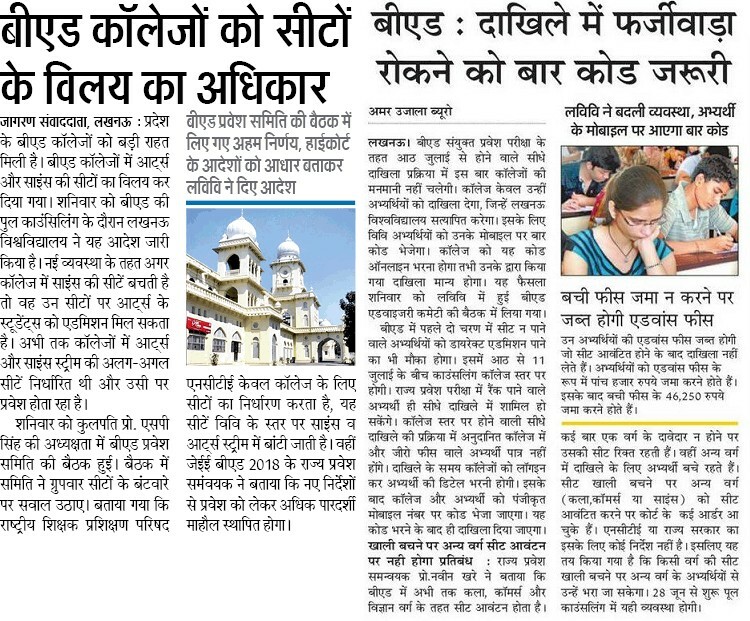 Now Candidates will have to appear for Counseling as per their Marks & Score Card. Full Details for UP B.Ed Counseling 20198 will be provided here. Candidates can also Know about their Rank, Chances for Admission in 2 Year B.Ed Course. Admission will be provided in Government Colleges, Self Aided Colleges, Private Colleges. 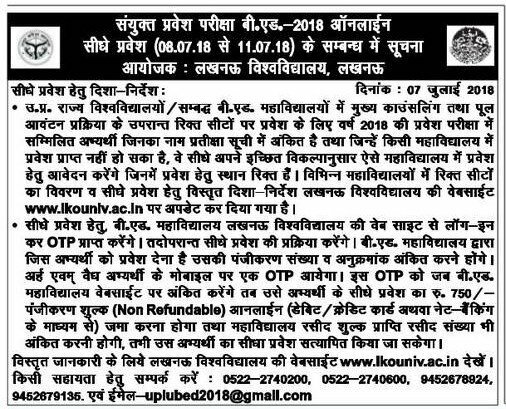 UP B.Ed Counseling Procedure 2019 (1st Round) : Step by Step Procedure for UP B.Ed Counseling 2019 is given hereunder. Candidates have to Make Registration First for UP B.Ed Counseling 2019. Collection of Counseling Fees : Candidates have to Submit Fee Rs. 5750/-(Counseling Fee Rs 750/- and Advance Rs 5000/-) The counseling fees and advance College Fees shall be submitted Online. Counseling of candidates & PIN (one time password) generation by NIC and communicating through SMS to candidates. Choice Filling: Candidates be given two to three days time for choice filling. The candidate’s may fill as many colleges of their choice from their homes or any other convenient places having internet connection. Documents Verification : After Issuance of Tokens, The candidates shall be issued file cover along with a booklet of containing details of various colleges at the counseling center. Candidates original documents on academic qualifications and other credentials shall be verified at the counseling center. Collection of balance Fees and issuance of confirmation letter :The candidates shall have to submit the balance fees by online payment, e-challan etc. Candidate shall visit NIC website again to fill their roll no., Date of Birth and transaction Id to get print out of confirmation letter of admission. Withdrawal of Draft of Rs 5000/- : The candidates to whom colleges are not allotted as per choice filled by them, they are required to visit counseling centers to collect the draft of Rs 5000/-, submitted by them within sevendays of rejection. Reporting of Candidate at the College: The candidates shall be required to report andjoin their respective colleges within five days of issuance of confirmation letter. Candidates are required to visit the counselling center only on the Day/Date specified as per their rank. Candidates are required to bring all the original documents and a set of photocopies of documents. Please note that various formats of certificates/documents is available in the Information Brochure available on the website www.upbed.nic.in. UP B.Ed Pool Counseling 2019 (2nd Round) : Candidates who took part in 1st Counseling & Not Allotted any seats, they can take part in Pool Counseling. Candidates have to Follow the Process of 1st Round in Pool Counseling. Pool Counseling will be conducted in July, 2019. Registration Fee of Pool Counseling is Rs. 750/-. Candidates has to submit full fee of Rs. 51250 in Pool Counseling. UP B.Ed Direct Admission 2019 (3rd Round) : Candidates who not allotted any seat in 1st two Counseling, they can take Direct Admission in Colleges. Counseling will conduct on College Level. Candidate who have State Rank, they can Take Part. After Verification from University, Admission will be provided. 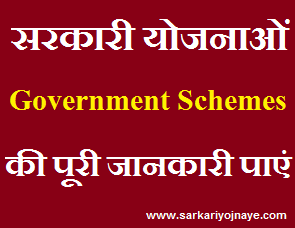 UP B.Ed Admission Fee : Govt. and Added College Fees : Rs. 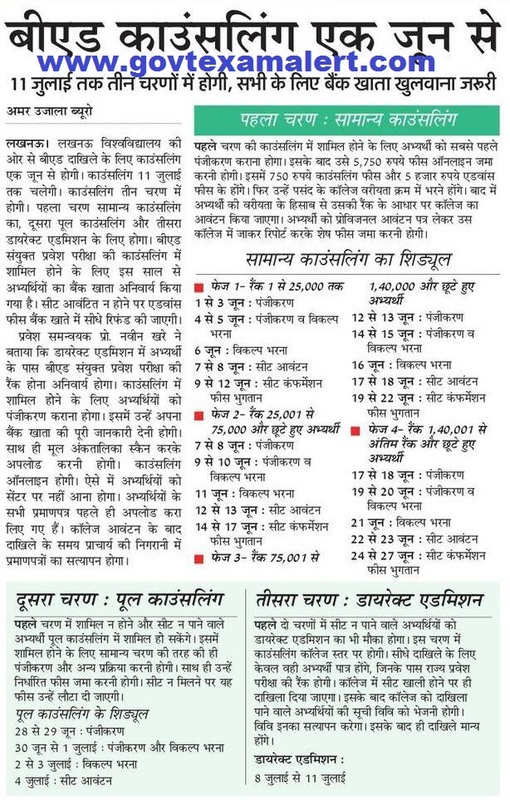 1400 to 5000/- Per Year, UP B.Ed Self Finance College Fees : Rs. 51250/- for 1st Year and Rs. 30000/- for 2nd Year. Result, Rank card of UP B.Ed JEE Exam 2019. Candidates can now check University wise College Vacant Seats Status for Pool Counseling. Check Vacant Seat Status from link given below………. All JEE B.Ed Aspirants can share their queries related to Result, They can also share their Views to get an Idea about their Chances in the exam. We will be happy to assist you. 2018 B.Ed counselling letter has not come yet. How can we give counselling? Plz send link how to download counseling letter. B.Ed counselling letter has not come yet. How can we give counselling?